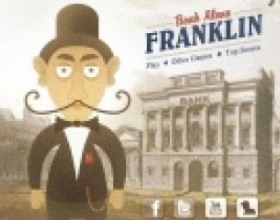 Mr. Franklin is the main local Banker. Once upon a time he decided to go to the work a bit earlier. He noticed that bank is full with thieves and the money is even falling out of their bags. Your task is to stop them and collect and bring all money back in safe. Use Arrow keys to move. Press Ctrl + Arrow key to change direction. Press Space to throw the bomb. Use R to restart level, L to go back to levels map. German version of the Hamster game. 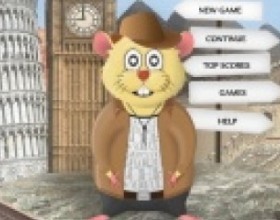 Help Hamster to travel around the World and discover different countries. Avoid enemies, use various pick-ups to finish all 30 levels and set the highest score. Use Arrow keys to move Hamster around the screen. Use various Pick-ups to simplify your task. 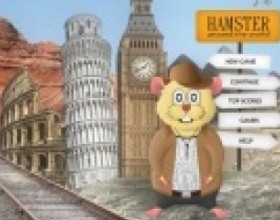 Help Hamster to travel around the World and discover different countries. Avoid enemies, use various pick-ups to finish all 30 levels and set the highest score. Use Arrow keys to move Hamster around the screen. Use various Pickups: Anchor - Stop at the first border, Nut - Become much faster than enemies, Weed - Enemies move slower, Cherry - Get extra points, Heart - Get extra life, Mushroom - All enemies stop. Participate Winter Olympic Games 2010 with Miga. Set the highest score in all disciplines and You'll be the winner. In Skiing you have to pass all flags as fast as you can. In Ski Jumping you must get maximal speed for your jump, hold your balance and make a perfect landing. Finally Snowboard - Finish the track as fast as you can. 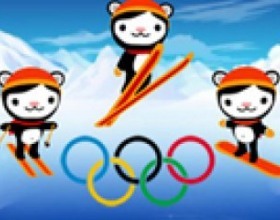 Use arrow keys and Space (only in Ski Jump) to control our Olympic Games 2010 mascot. Submit your score.